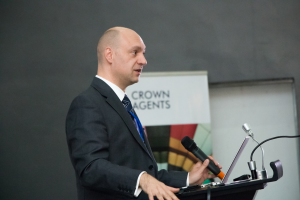 At an event organised by Crown Agents, UAVaid co-founder Daniel Ronen delivered a talk at Baze University, in the Nigerian capital of Abuja, on 5th July. Speaking to an audience of government officials, university faculty and students, Daniel spoke about the latest developments in UAV (drone) technology, their applications and the UAVaid project. Daniel Ronen speaks at Baze University, Nigeria. The event was organised by Crown Agents Nigeria. The talk was presented to and discussed the opportunities for economic development and humanitarian assistance in the developing world, and Nigeria in particular. 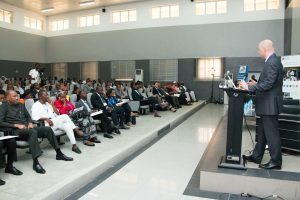 The audience included members of academic staff, students and members of the Nigerian government, including the Ministry of Agriculture and Ministry of Health. Following the presentation, questions from the audience were answered as part of a panel of local and international UAV experts and users. Lecturing students, staff and Nigeria government on UAV applications and development. The event was covered by The Guardian (Nigeria) Newspaper. Full article available here.